One of the top and highest ranked golfers to play golf at Florida State…ranked No. 36 on the World Amateur Golf Ranking scale and No. 83 on the European Golf ranking scale (as of March 31, 2019)…has been ranked as high as 18th on the World Amateur Golf Ranking scale…helped lead Sweden to a tied for 11th place team finish in the 2018 World Amateur Team Championships in Ireland…finished tied for 72nd in the individual standings at the 2018 WATC…a member of the Swedish National Team and played on the Junior Solheim Cup Team in 2018…has played in big events and flourished under pressure against the world’s top players – two learned experiences that will certainly help her during her entire career at Florida State…played in the U.S. Amateur Championship for the first time in her career during the summer prior to her freshman season at Florida State. Advanced to the round of 16 in match play at the U.S. Amateur Championship at the Country Club of Tennessee…finished in a tie for 33rd place with a 1 under par score of 141 during two rounds of stroke play (70-71)…defeated Stephanie Lau of the United States, 2 & 1, in the first round of match play…topped No. 6 seed Suzuka Yamaguchi of Japan, 1 Up, in the round of 32 before falling to Gurleen Kaur of the United States by a 2 & 1 margin…helped lead Sweden to a tied for 11th place team finish in the 2018 World Amateur Team Championships in Ireland…finished tied for 72nd in the individual standings at the 2018 World Amateur Team Championships…finished at 9 over par in the WATC with scores of 80-71-76-72=299. One of four Seminoles to play in all four events during the fall season – the Cougar Fall Classic, the Schooner Fall Classic, the Stanford Intercollegiate and the Jim West Challenge…the Seminoles’ second leading golfer with a 71.09 stroke average and seven rounds scored at par or better…a 68 in the first round of the Schooner Fall Classic ranks as the best single-round score of her career…totaled three rounds with scores in the 60’s — the second highest total on the team for the fall season…Florida State’s team leader with two eagles – one in the Stanford Intercollegiate and one in the Jim West Challenge…earned two top-15 finishes (tied for 12th in the Jim West Challenge and tied for 13th in the Stanford Intercollegiate) and two more top-30 finishes (in the Cougar Fall Classic and the Schooner Fall Classic)…a total of 4 strokes under par for the four matches she played in during the season…under par in three of the Seminoles’ four events — -2 at the Cougar Fall Classic, -2 at the Jim West Challenge and -1 at the Schooner Fall Classic…finished in a career-best tied for 12th place in the individual standings with a 2 under par total of 214 at the Jim West Challenge…carded a 3 under par 69 in the final round of the Jim West Challenge… scores of 75-70=145 in the first two rounds of the Jim West Challenge had her in a tie for 22nd place in the individual standings…finished in a tie for 13th place at the Stanford Intercollegiate to earn her first top-15 finish as a Seminole…carded scores of 74-69-71 for a 1 over par total of 214 to finish second among her Florida State teammates…finished in a tied for 13th place at the Stanford Intercollegiate to earn her second top-15 finish as a Seminole…carded her career-low score with a 3 under par 68 in the first round of the Schooner Fall Classic…was in a tie for eighth place in the individual standings after the first 18 holes of the Schooner Fall Classic with her score of 68…finished at 1 under par and in a tie for 28th place in the Schooner Fall Classic…averaged 71.09 strokes in 11 rounds during four tournaments. Completed her high school degree requirements at the upper secondary school of Korrespondensgymnasiet in her native Sweden in 2018…won the individual title at the European ANNIKA Invitational in 2016…placed second in Skandia Lady Junior Open in 2016, second at the French International Ladies Amateur Stroke Play Championship in 2016, second in the French International Lady Juniors in 2016 and 2017 and second in the Skandia Junior Open in 2017…finished third in the 2017 Portuguese International Ladies Championship…finished in the top-10 of the ANNIKA Invitational USA presented by Rolex in 2018 and finished in the top-five at the 2018 French International U21 Championship…advanced to the match play portion of the 2017 Ladies British Open Amateur Championship where she fell to Leona Maguire in the match play round of 16…teamed with current Florida State freshman Frida Kinhult on the Swedish National Team that won the 2017 European Girl’s Championship in Finland…the Seminole pair also teamed to play on Team Europe in the 2017 Junior Solheim Cup – an event that was played on American soil in Iowa. 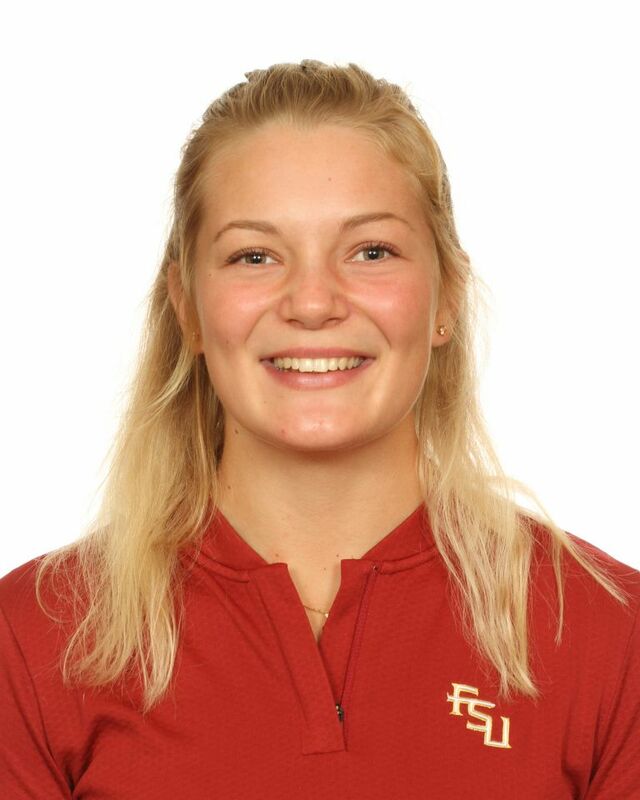 Born April 5, 1999…Beatrice is the daughter of Veronika and Christer Wallin…lists her favorite golfer as Annika Sorenstam…her favorite club is her putter…began playing golf at age six. Driver: Ping G400. Wood: Ping G400. Hybrid: Ping G400. Irons: Ping i200. Wedges: Ping Glide 2.0. Putter: Scotty Cameron. Ball: Titleist Pro V1. Favorite Club: My Putter. Ball Marker: Series of Dots.